Global construction glass market expected to reach approximately USD 138.3 Billion in 2023, growing at a CAGR of slightly above 7.0% between 2017 and 2023. The glass contains certain components that are present in minor quantities to achieve desired properties such as color, heat resistance, abrasion resistance and strength. The report covers forecast and analysis for the construction glass market on a global and regional level. The study provides historic data of 2015-2017 along with a forecast from 2018 to 2023 based on volume (Kilo Tons) and revenue (USD Billion). 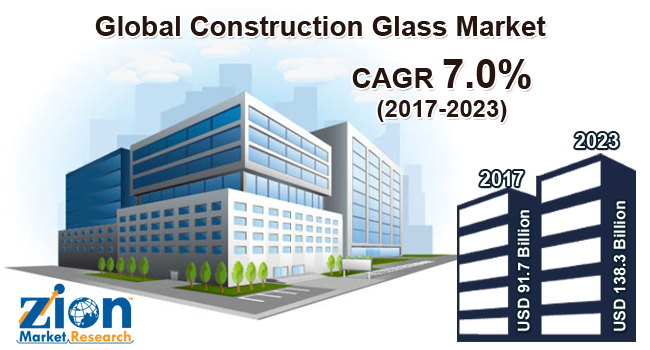 The study includes drivers and restraints for the construction glass market along with the impact they have on the demand over the forecast period. Additionally, the report includes the study of opportunities available in the construction glass market on a global level. This report offers comprehensive analysis on global construction glass market along with, market trends, drivers, and restraints of the construction glass market. This report includes a detailed competitive scenario and product portfolio of key vendors. To understand the competitive landscape in the market, an analysis of Porter’s five forces model for the market has also been included. The study encompasses a market attractiveness analysis, wherein all segments are benchmarked based on their market size, growth rate, and general attractiveness. This report is prepared using data sourced from in-house databases, secondary and primary research team of industry experts. The study provides a decisive view on the construction glass market by segmenting the market based on type, structure, manufacturing process, chemical composition, application, and region. All the segments have been analyzed based on present and future trends and the market is estimated from 2018 to 2023. Based on the type, the segmentation of construction glass market is Insulated glaze units, Glass wool, Glass blocks, Toughened glass, Tinted glass, Chromatic glass, extra clean glass, Laminated glass, Shatterproof glass, Float glass. Based on the structure, the segmentation of construction glass market is Roof, Partitions & walls, Staircase, Beams, and Floors. Based on the manufacturing process, the segmentation of construction glass market is Float and Rolled/Sheet. Based on chemical composition, the segmentation of construction glass market is Soda-lime, Potash-lime, Potash-lead. Based on application, the segmentation of construction glass market is residential and non-residential. The regional segmentation includes the current and forecast demand for North America, Europe, Asia Pacific, Latin America, and the Middle East and Africa. Each region has been further segmented into countries such as the U.S., UK, France, Germany, China, India, Japan, and Brazil. The report covers detailed competitive outlook including the market share and company profiles of the key participants operating in the global construction glass market such as Saint-Gobain S.A., PPG Industries, Guardian Industries, Sisecam Group, Schott AG, China Glass Holdings Limited, Central Glass Co., Ltd, and Nippon Sheet Glass Co., Ltd and amongst others.